Foot tubes are no longer available at your retail stores. We are your supplier of the synthetic foot tubes that dancers stretch over their shoes to make a floor easier to dance on. You will be amazed how much easier you will turn! Foot Tubes will lessen the strain on your knees. We sell to individuals and instructors. You instructors, may want to purchase from us in bulk and sell the Foot Tubes to your students. Going rates are $4 - $5 per pair. These work excellently on *Smooth* polished concrete (such as Terrazzo) and on vinyl tile / wood etc. NOTE!!! : Dancers Foot Tubes cannot be used on a rough surface. These are knit and anything that can "snag" it will destroy the knitted product. WARNING: Stretching foot tubes over shoes will drastically change your shoes -traction- with the floor. Be very careful to test the *slickness* before sailing out on a dance floor. Use of these can and does create a slip and fall hazard. We have a large number in stock. They come in Black, White, Purple, Fuchsia Pink, Tan and Red. (all 2” wide). Georgia residents must add 7% sales tax. Shipping is $8 for one to five Doz; $11 six - ten Dz. $16 ten to fifteen Doz Ask about orders over 15 Doz. Please be sure to give a full mailing address and phone number (ZIP + 4 Please) Prices for shipment are for USA. Please e-mail us to discuss International shipping. 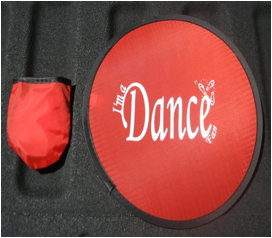 We also stock and wholesale the FOLD UP DANCE FANS with the logo “I’m a DANCE Fan”. These are great to have when you work up a sweat on the dance floor. These are the “Pretzel type with a pouch”. They fold up nicely and can be carried in your purse or back pocket. These are $2.50 each (when ordering one to five) and $2.25 each if you order SIX or more. The same domestic postage rates apply. To protect YOUR credit card number we use PAY-PAL If you prefer not to use Pay-Pal. PLEASE contact us for other payment arrangements. We will take personal checks. We do not accept Credit Cards. There are different drop down boxes below for the various colors of FOOT TUBES or to order the DANCE FANS. Please contact us at: dancersfoottubes@gmail.com for our mailing address and to see if we can fill your quantity needs, or if you need additional info or have questions. 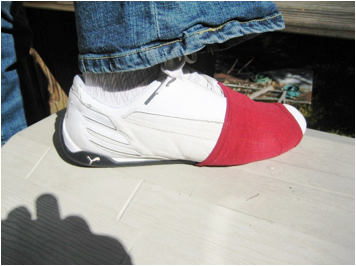 If you have never used these Pull the Tube to the ARCH of your foot… Where your shoe narrows this will help keep it on your shoe… Then ease it out toward the ball of your foot as needed to give you a comfortable feel on the floor. 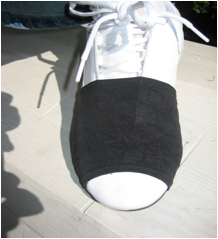 If you have laces, safety pin it to your laces to help keep it from coming off your shoe. Be Safe!! Have fun dancing! !